Breathing problems in cats can be much more severe than the animals behavior would suggest. Cats may not show significant clinical changes until their breathing is severely compromised and at this stage they can rapidly develop respiratory failure and die. in more severe cases open mouth breathing. or decreased ability to exercise. 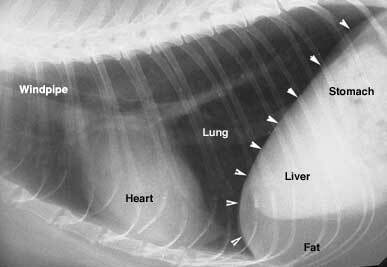 Any cat with breathing problems should be examined by a vet and may need to have chest Xrays. The problem is often more severe than it appears to be and any type of stress can lead to sudden death. If possible we are likely to put these cats in an oxygen tent for some time before proceeding to radiology. Feline asthma is the name given to a feline disease which has similar clinical signs to human asthma. It occurs when the small airways in the lungs (bronchi) constrict, a process known as bronchospasm. The reduction in airway size occurs at the same time as an increased mucous production in the airways, and the two combine having a severe effect on the cats breathing. The signs may occur slowly or suddenly and may be made worse by exposure to irritants such as smoke, dust or pollens. If the Xrays suggest asthma we may then need to determine if it is infectious, allergic, or parasitic. This is often done by collecting samples of fluid from the lungs and sending it to the laboratory for analysis. We may also do a blood test or an ultrasound to rule out cardiac disease. Asthma can be a life threatening disease requiring emergency treatment. Cats need to have stresses minimized and need to be placed in an oxygen enriched environment, they are then treated with rapidly acting corticosteroids and bronchodilators. The cortisone can be given orally or by inhalation using a pediatric spacer and a face mask. Most cats will require long term treatment with cortisones as spontaneous cures are very rare. 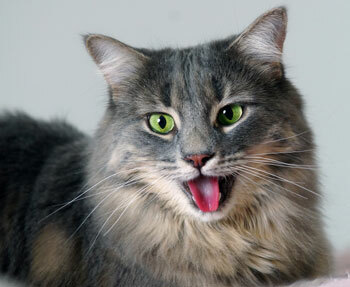 Hear Disiease in cats can be hard to diagnose and may require a blood test or ultrasound exam. Pyothorax is when an infection occurs in the chest outside the lungs, fluid builds up around the lungs which stops them expanding and therefore the cat can’t breathe, it is treatable by surgery and can be cause by grass seeds, viral infections or bacteria. Chest Injuries are common in cats usually as a result of trauma such as being hit by a car.